While there are many ways in which celebrities differ from the rest of us, they’re the same in at least one respect. Thanksgiving, even in Hollywood circles, seems to be devoted to the classics: food and family. This year, stars Kelly Clarkson, Kris Jenner and more took to social media to express their gratitude through heartwarming photos of loved ones — and, naturally, some serious eats. Check out how some of your favorite celebrities spent Thanksgiving this year. How do their traditions stack up to your own? Oprah Winfrey shared a video of herself and a group of fierce females in her life “singing home” girls as they arrive for the festivities. Every time a new girl arrives we sing them home. Makes for an even happier Thanksgiving! 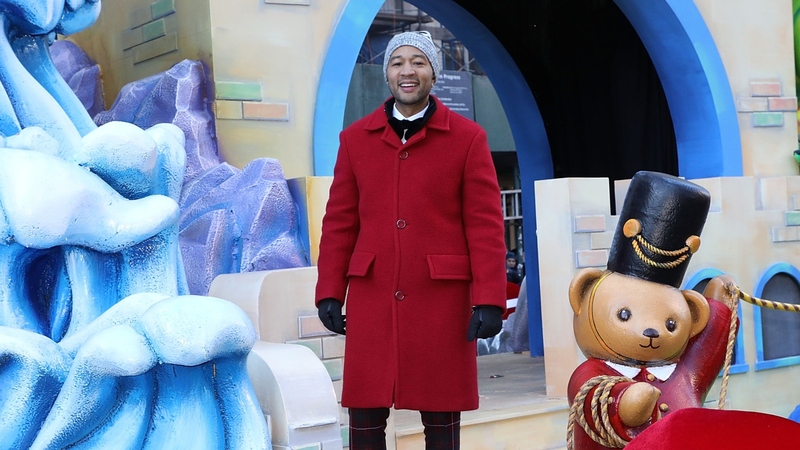 After being hilariously trolled by Macy’s for saying in 2014 that she couldn’t imagine being bored enough to watch a parade on TV — with the knowledge that this year, John Legend is actually in that parade — Chrissy Teigen did what only she could do: live-tweeted herself watching the Macy’s Thanksgiving Day Parade. Blake Lively played a little “expectations vs reality,” posting a photo of herself all glammed up (expectation) followed by one of her eating takeout in the back seat of her car (reality, not to mention #momlife). Katie Couric devoted her Thanksgiving Insta post to a few of her favorite things, among them iced coffee, The Handmaid’s Tale, family, Central Park, maple syrup, laughing babies, pajamas, poetry, eyelash extensions, California firefighters and a free press. Couric’s fellow anchor, Hoda Kotb, shared a photo of her family gathered around the table — with football on in the background, to boot. Although Dwayne Johnson is currently in London, he still celebrated Thanksgiving with a traditional turkey dinner. Also on the menu? A heaping helping of gratitude from the Ballers star, who shared via Instagram a memory of being too broke to even afford a turkey. Kelly Clarkson posted a photo of herself performing at the Macy’s Thanksgiving Day Parade. A performance which, for the record, she slayed — without lip-syncing or backing in 19-degree weather! Olivia Munn traveled in good company for the holidays, posting a short video clip showing her festive pups in tow. Kris Jenner spent the day with “generations of love” in her photo, she captured her mother and her granddaughters Chicago West and True Thompson (whose parents were presumably nearby). Speaking of those parents, Khloé Kardashian posted a photo of herself with daughter True (at an elegant Thanksgiving table). “Thankful you picked me,” the proud mama captioned the sweet pic. Quantico star Priyanka Chopra posted a wildly impressive picture of her family seated at a table that looks about a mile long, with fiancé Nick Jonas at the end, writing, “Happy Thanksgiving.. family.. forever.” The couple celebrated in India. “Thankful for mornings like this with the ones I love most. I am truly blessed,” A-Rod captioned a photo of himself snuggled up in bed with girlfriend Jennifer Lopez, her kids and his kids. Cozy! Another new mama, Gabrielle Union, shared a photo of her husband, Dwyane Wade, along with their precious new bundle. “Thankful and Happy. Very Thankful and Very Happy. Love to you and yours,” Union said.